If you’re not looking closely for it, you just might miss it. Hidden within the winding roads of Thao Dien is a shaded street lined with boutique apartment buildings and decorative foliage. An array of colorful signs points you in the direction of Morin Apartment and housed on the first floor of this building is the retreat that is Leelawadee Spa Authentic Thai Therapy (Ground floor, Morin Apt, 5/19 Street 64, Thao Dien, D2). Instantly relaxing at the first whiff of lemongrass, glints of ornate ruby and gold decor catch the eye and detailed tray stands are topped meticulously with bowls of ginger, lime, scrub and essential oils. The waiting area contains seats for foot reflexology, and beyond this is a room for aromatherapy and hot stone massage, overlooking a charming private garden. The room holds two beds, making it a romantic setting for partners or a personal escape solo. 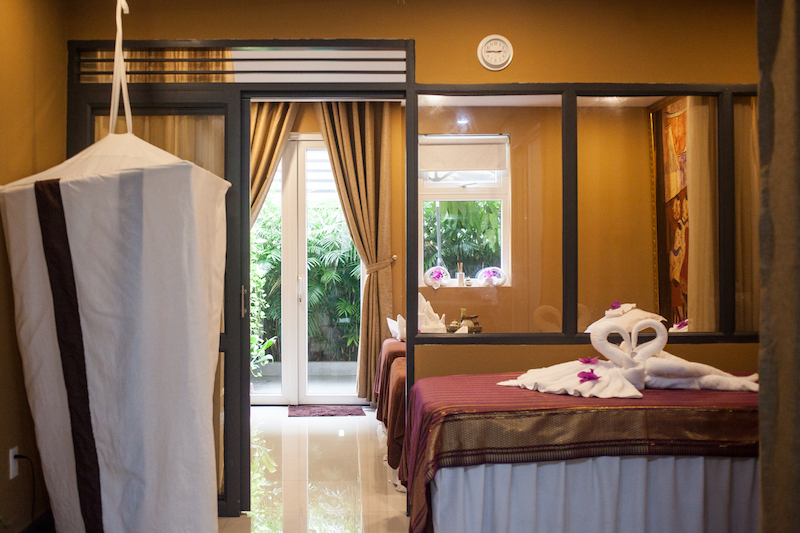 However, for a traditional Thai massage, you are ushered to a room just above the waiting area with two thick massage beds resting on the floor, typical in Thai massage style. Thai massage can be quite intense and first-timers are warned that they may leave feeling somewhat sore for a day or two, but once the soreness subsides, a fluidity and lengthening within the muscles is unmistakable. This is why it can be extremely beneficial for those who lead active lifestyles. Traditional Thai massage incorporates stretching and posing, utilizing ancient yogic principles and building connectivity holistically. It was conceived 2,500 years ago as a confluence of Indian, Chinese and Southeast Asian healing practices and was said to have been founded by Shivago Komarpaj, the Buddha’s personal physician. Masseuses are skilled in acupressure points, which they trigger in order to relieve stress. This helps blood circulate and ultimately refreshens the entire body. You are fully clothed as the massage does not use oil, but can if requested. Once the feet have been scrubbed and cleansed while seated upright in a chair, the recipient lays down face first on the bed. It begins with the feet, then carries on to the legs which is a focal point of the massage, slightly differing from other classic styles that may focus more on the upper body. Once the legs have been alleviated, the back, shoulders and arms are next. There is a laying of hands and pressing, following the lines of the body. After this, you are asked to sit up and are stretched, rocked, twisted and pulled gently to complete the session. 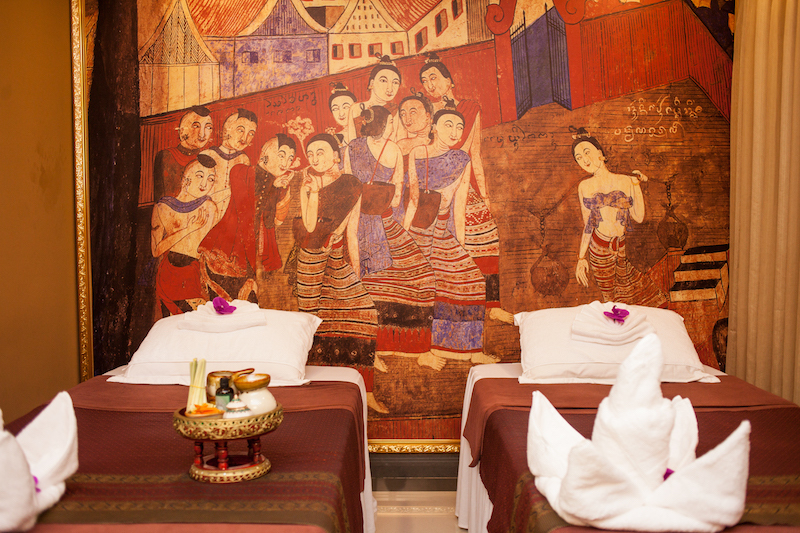 Traditional Thai massage is VND350,000 for one hour, and VND500,000 for 90 minutes. If traditional Thai massage seems intimidating at first, they offer other various styles of massage, as well as facials, hot pack compresses and waxing. Double and triple rooms are available for couples, families and groups. Masseuses are experienced and will adjust any portion of the massage for your comfort, especially if this style is new to you. Leelawadee Spa was opened a year ago by owner MiMi, who moved to Saigon from Bangkok for, “just a few months,” five years ago. After learning the technique of traditional Thai massage in Thailand and working in spas both there and in Ho Chi Minh City, she opted to open her own and built it with the vision of the spa-goer in mind, “I like to get massages myself, so I understand what people look for when they look for a good one. I want to share this experience,” she explains. MiMi has succeeded. Feeling utterly blissful, you leave Leelawadee with a renewed sense of connection to your body and ancient tradition. For more info and booking, visit their Facebook or call 89 934 2965.